Brand New from 2006! Adorable full body sculpts shown below just in! We just loved them at AU! Just $700.00 each! The Birthday Girl is SO.... CUTE too.... again, very reasonably price. Debra has attended one of our shows and participated in last years. 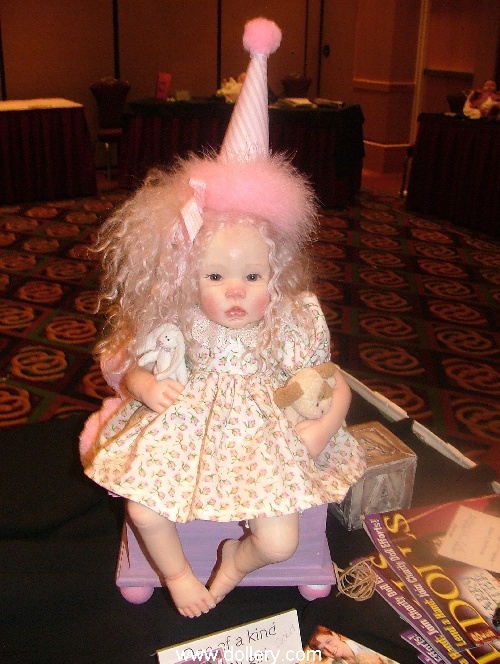 She will participate and or attend again this Oct 2006 for our 24th Annual Doll Show. Email kmalone@dollery.com to get on our mailing list for her work and to receive our free 24 page full color catalogue. Call 800-447-3655 (Doll) outside Ma or 781-447-6677 in Ma. 21", One of a kind Cernit mix head arms and legs. Cloth body Hazel glass eyes and blonde mohair wig. Madeleine is dressed in a custom made white cotton ruffle dress with matching bloomers. She comes complete with her teddy. Brand New for 2006! We couldn't resist this adorable Party Girl! One of a Kind. Sits on a wooden chest and carries a little bunny! Total height while sitting on the chest all the way to the tip of the hat is 25 inches. Blond hair with blue eyes. Party Girl (above) $1,150 one of a kind. Sitting on wooden chest. Height of entire piece from the top of the hat to the bottom of the chest is 25 inches. In Stock & Ready to Ship! Naked Babies - Full body sculpts! Adorable! One of a Kinds. 9 1/2 inches. Baby in blanket is sold. Baby in Bonnet is In Stock & Ready to Ship! Naked Babies are $700 each! One of a Kind, 9 1/2 inches tall sitting on wooden base. $1,250 One of a Kind, Cernit Head and arms and legs. Cloth body with stuffed pellets and fiberfill. Closed eyes with light brown mohair. Approx. 16" long. Cernit cloth with poseable wire armature, sculpted arms and legs under knee. Grey German crystal glass eyes, Light brown mohair. 20 inches. April has a cotton dress and bloomers. The adorable bonnet has dried roses on top. Kylie is from 2003 but has been re-wigged with a soft head of blond mohair. Kylie has dark blue German glass eyes, approx 22" tall & 11"sitting. Poseable cloth body. Sculpted from cernit/sculpey. Cream/beige color cotton romper with cotton lace collar. She holds a teddy bear handmade by Debra Lynn. Julia is from 2003 but has been re-wigged with a soft head of mohair. Dark grey German glass eyes. Approx 22" tall, 11" sitting. Poseable cloth body. Sculpted from cernit/sculpey. Off white color romper with lace collar. She holds a teddy bear handmade by Debra Lynn.